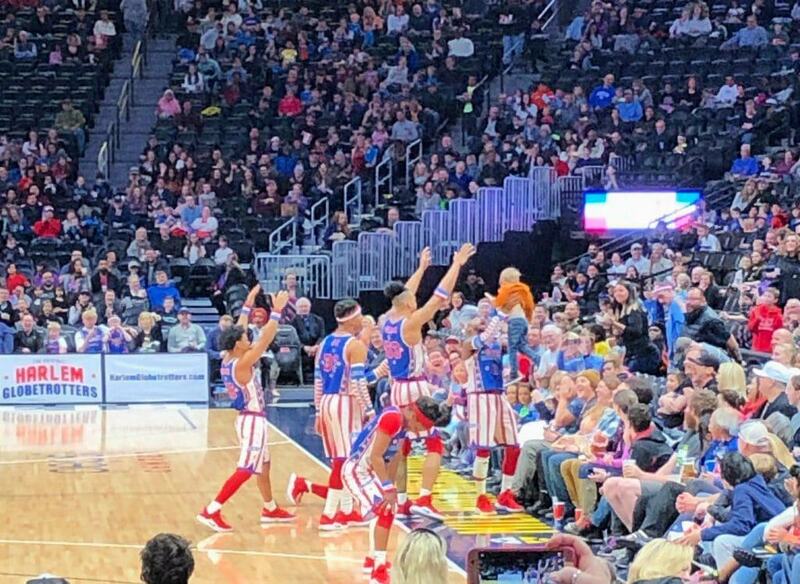 The Harlem Globetrotters came to Denver and we had an incredible time and learned a ton. As first timers we wanted to share what you need to know about The Harlem Globetrotters. Check it all out below and grab the promo code to save big! Disclosure: We partnered with the Harlem Globetrotters. All opinions are my own. 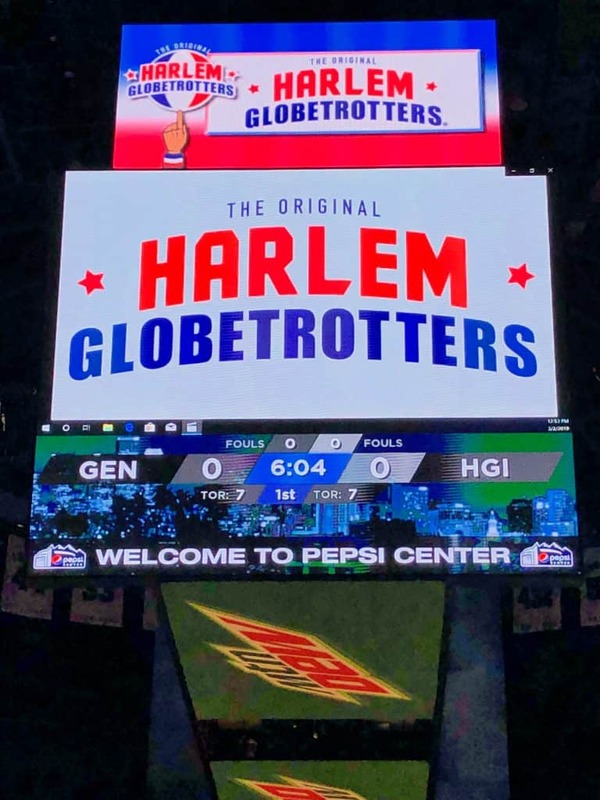 I have a personal connection to the Harlem Globetrotters which inadvertently kept me away from this incredible experience. I won’t go into details (you can email me if you are interested), it was nothing negative, just something that reminded me of a person that passed away. 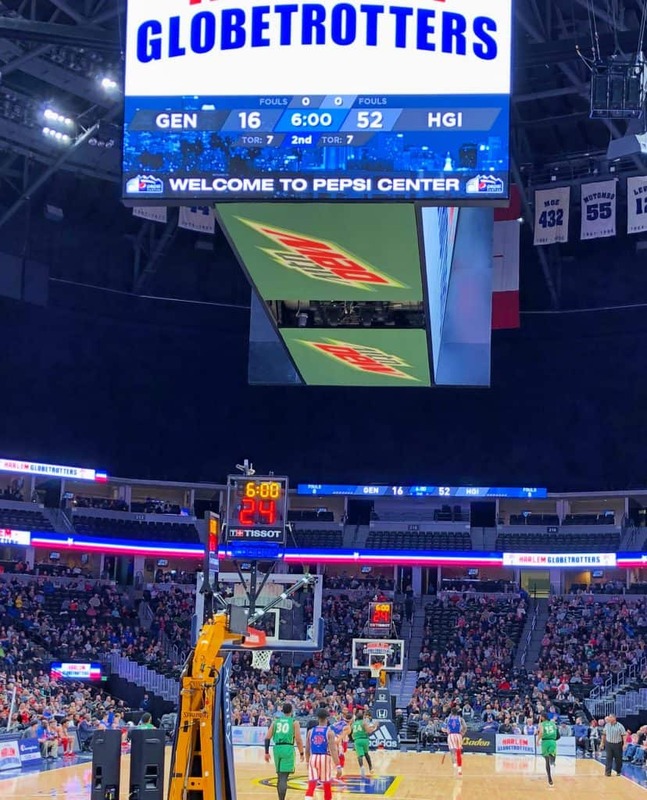 For years, we would see that the Harlem Globetrotters were in Denver, and each year my husband would say that he wanted to go. Finally, this year, I wanted to honor my friend and see the team that he cherished. The Harlem Globetrotters are a well known basketball organization known for their fun shows, silly antics and one heck of an interactive show. My family had never been, but we were lucky enough to take in a show a couple weeks ago. It was everything we had imagined and more laughs then we could handle. So worth it. 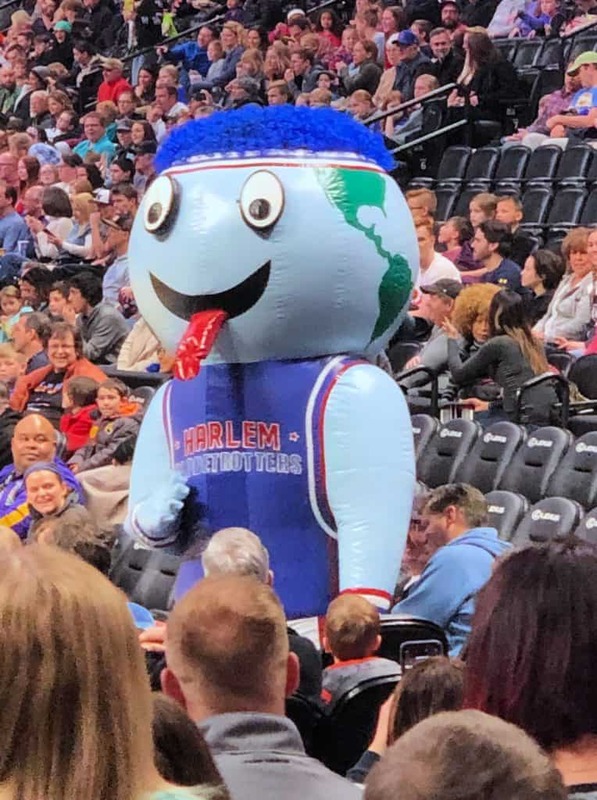 Every sports team has a mascot and the Harlem Globetrotters have a loveable little globe man named Globie. The picture below is of GIANT Globie, but there is also a much smaller version of him as well. My family and I could not stop laughing at how funny and athletic this mascot was and truly enjoyed watching him just as much as the game itself. We all know that the Harlem Globetrotters are showman and that the “game” is effectively rigged. Well, um…sort of. The Globetrotters play their rival the Washington Generals each game. The Generals goal is to actually play the game and try to win…and they have won before. The catch…the Harlem Globetrotters have the upper edge. They play games, make silly calls, mess with the refs and in general do everything they can to distract and then show off their amazing dribbling, shooting and slam dunk skills. Sure there is a score, sure the players can actually play ball, but it is all in good fun and you can see everyone out there is really enjoying the time on the court together. Including the fans. The fans are center court in this all-new world tour with the Harlem Globetrotters. Every few minutes there is some sort of audience participation and silly skit with some random person that was pulled out of their seat and put into the game. So many laughs are had and it really makes each show different because you never know exactly how the fans will react. Like that little baby in orange being held up like Simba from The Lion King. That baby was NOT having it and it was truly hysterical. Be prepared to be pulled onto the court and to laugh so hard that your sides hurt. This all-new fan powered world tour is definitely full of fan-filled action! If I am going to be honest here, I truly did not think there was an actual game to be played or that there would be so much audience participation. I think I expected it to be all basketball tricks and nothing more. I was so wrong and so glad that I was wrong. There was a ton more going on, but those tricks were definitely there. From slam dunks, to stunning dribbling skills and passing that I couldn’t even keep up with, there was always something new and impressive to see while the game was happening…and it was from both sides of the bench! 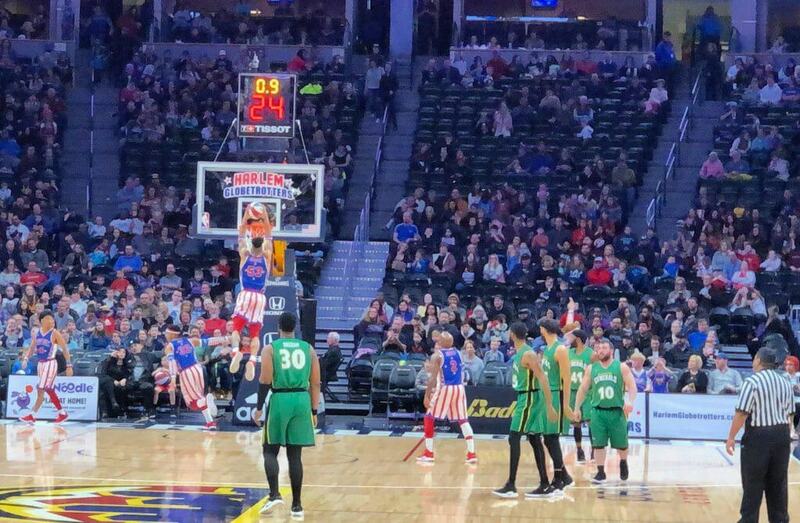 Those Washington Generals had a few tricks too and it was fun to see both teams show off their incredible skills! Check out a Show Near You! We had a great family day at the Harlem Globetrotters and will definitely be going back. I hope other families consider taking some time to laugh, relax and see some truly incredible athletes in a great arena near them. 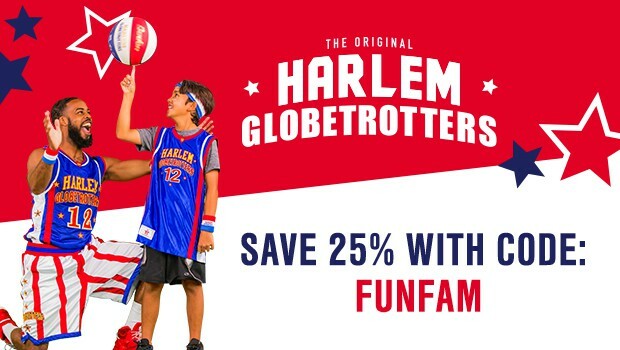 The Harlem Globetrotters are offering an awesome discount code for 25% off your tickets. Just enter “FUNFAM” at checkout to save big! Have you seen the Harlem Globetrotters? Previous Post: « Happy 6th Birthday Peanut!